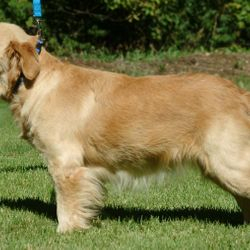 Greta was bred to a Champion American Golden male. Top bloodlines, beauty and brains. Reserve your puppy early for a top pick. Everyone comments on how beautiful Pearl is, everywhere we go. And of course, we agree! Her looks are quite striking. She was popular in Breckenridge, CO this summer. Everyone had to pet her and she loved the attention. She gets attention wherever she is. Pearl is very smart. Within 4 days of living with us, she could sit, shake, and lie down. She learns everything very quickly. She now knows many commands and tricks. Pearl is very good at scent work. She loves to play “Find It”, and locate her treats by using her nose. 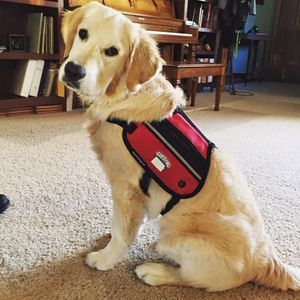 I have trained her informally, and wish there was a place locally where she could get certified in scent training. She is very good at it, and enjoys the challenge. She is growing up quickly, and getting sweeter and more obedient every day.